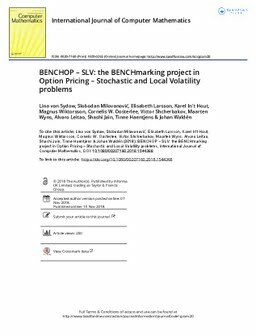 In the recent project BENCHOP–the BENCHmarking project in Option Pricing we found that Stochastic and Local Volatility problems were particularly challenging. Here we continue the effort by introducing a set of benchmark problems for this type of problems. Eight different methods targeted for the Stochastic Differential Equation (SDE) formulation and the Partial Differential Equation (PDE) formulation of the problem, as well as Fourier methods making use of the characteristic function, were implemented to solve these problems. Comparisons are made with respect to time to reach a certain error level in the computed solution for the different methods. The implemented Fourier method was superior to all others for the two problems where it was implemented. Generally, methods targeting the PDE formulation of the problem outperformed the methods for the SDE formulation. Among the methods for the PDE formulation the ADI method stood out as the best performing one.